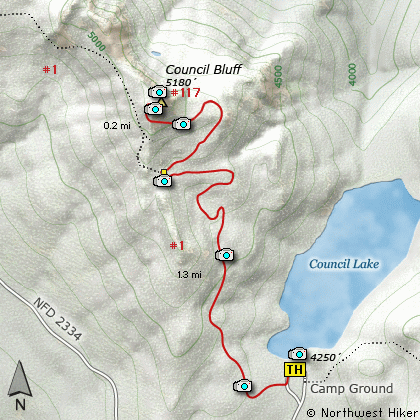 This hike begins at the Council Lake campground off Forest Road #016 which is just a short distance from FR #23. Be sure to enjoy Council Lake before or after your hike up Council Bluff. The first mile of this hike follows an old road. Be aware that motor bikes are allowed on this stretch of the trail. 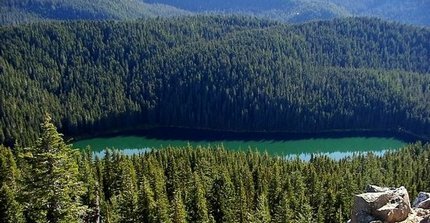 All of the first mile of this hike is within dense timber with only a rare glimpse out at Mt Adams or Council Lake below. At about a mile you will come to the junction of Trail #117 which is the foot only trail to the top of Council Bluff. At this point you break out of the dense forest and are out in the open. Now you get to see why this little hike is so worth it. The trail begins on the east side of the bluff then works its way around the south side and approaches the top from the southwest. The rewards for reaching the top of Council Bluff are in the magnificent views. Mt Rainier, the Goat Rocks, Mt Adams, Mt Hood, and of course Mt St Helens (but not from summit). From Portland, travel east on Interstate Hwy 84 to Exit 64 at Hood River. Turn left, and pass under the freeway and cross the toll bridge ($2.00) into Washington state. Turn left onto SR14 and drive approximately 1.5 miles to state road 141 Alt. Turn right onto SR141 Alt. and follow it another 2 miles and merge bearing left onto SR141. Then travel north on SR141 for another 19 miles to Trout Lake and the junction to Mt. Adams Road. Bear right and forward onto Mt. Adams Road for about 1.3 miles and you come to the junction with Forest Road 23. Bear left and ahead onto FR23 and continue north for about 19 miles and you will come to the junction with Forest Road 90. Take a sharp right uphill turn and continue on FR23. At this point the road becomes very rough surface and you will follow this road for just under 3 miles. You then come to the junction of Forest Road 2334. Turn left onto FR2334 and follow it for a mile and a half to Forest Road 016 that leads straight ahead to the campground at Council Lake. Park in an appropriate place above the lake. The trail begins as an old abandoned road.